Alacare Home & Hospice is a dedicated center that provides patients palliative, nursing, hospice and rehabilitative care in a cost-effective home environment. They are the oldest home health agency, certified by Medicare. The team of the center is comprised of home care aides, nurses, occupational, physical and speech therapists, medical nutritionists, medical social workers and even chaplains. Charles D. Beard, Jr., founded the center in 1970. They are still owned and maintained by the members of Beard family. Birmingham Business Journal named them among Top 10 Best Places to Work for the sixth consecutive year in 2011. Alabama Business Magazine categorized them as the third Best Company for working. 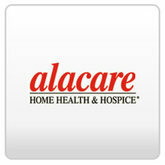 There are currently 0 consumer reviews about Alacare Home Health & Hospice available. Share your review. Please take a note that you are about to post a public review about Alacare Home Health & Hospice corporate office on CorporateOffice.com. This review will be public, so please do not post any of your personal information on this website. If you would like to contact the corporate offices of Alacare Home Health & Hospice, please use their contact information such as their phone number, website, and address listed above to contact them. However, sometimes staff from Alacare Home Health & Hospice headquarters do read the reviews on this website.